Since graduating in 2014, Poppy Townsend has gone on to work as an Atmospheric Data Scientist for the Centre for Environmental Data Analysis (CEDA). The same month that I graduated from Plymouth, I started at CEDA as part of the Science and Technology Facilities Council (STFC) graduate scheme in September, 2014, as an Atmospheric Data Scientist. Right from the beginning I was trusted with real tasks and given the responsibility to contact our users. My main role is to contact data providers from the Atmospheric Science community, to discuss their data management requirements. I liaise with them until they are ready to archive their data with us. 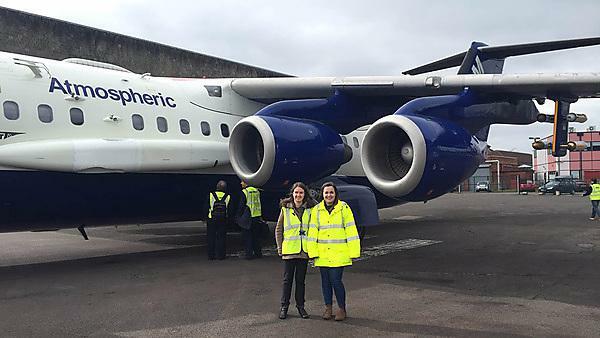 In 2016, I was given the opportunity to go on a three month placement at FAAM (Facility for Airborne Atmospheric Measurements) which is the UK’s largest atmospheric research aircraft – basically a flying laboratory that can fly down to 50 meters above sea level! I was even lucky enough to go on a field campaign with them to measure the Indian monsoon. Actively seek out any training or internships that you can find. Get as much experience as you can! I have learnt that if you don’t ask, you don’t get. I am currently studying for a masters (with support from work) in Science Communication. I would never have done this without actively asking if it was possible. I used the careers service when I was applying for my job; they gave me advice on my CV and how to tackle assessment centres. As I started work the same month I graduated, they clearly gave good advice! The library was basically my second home; without the many hours spent in there I wouldn’t have finished my degree. I surprisingly miss the time spent there! I never really knew what I wanted to do when I finished university – and I’m still unsure now – but I think studying at Plymouth has enabled me to feel secure in my future career prospects. As long as you keep your options open, say yes to opportunities that present themselves and actively seek out your immediate goals, you will land on your feet. The celebrations after exams will always be my favourite memories: the social side to university was massively important to me. The summer ball was an especially great way to finish the year! The expertise and support you receive during your studies is great and I am still in contact with several of my lecturers. But I also think it’s really important to have a varied social life alongside your degree. I’d love to go back and do it all again!